Earlier this year, the Edelman Trust Barometer reported that only 20% of people feel that current economic and social systems are working towards their interests. In a similar vein, a recent World Economic Forum survey on globalization uncovered a widespread belief that government-driven initiatives, such as law and regulation, are failing to generate sufficient opportunities. An urgent yearning for new direction has marked the start of 2019. The Forum of Young Global Leaders, the World Economic Forum’s foundation for remarkable leaders under 40, was founded to fuel new models of leadership. Every year, our organization seeks out changemakers with the grit, foresight and potential to improve the state of the world. We look for individuals who reflect global diversity, innovate to promote public interest, and value authentic exchanges towards public-private cooperation. Our team invites them to join a five-year programme, cultivating generosity of spirit and the recognition that the world can only mirror our hopes if we work together. The YGL community is made up of more than 1,300 members and alumni, including public officials, business innovators, artists, educators, technology developers, journalists and activists. The mission of the Forum of Young Global Leaders is to create a dynamic global community of exceptional people with the vision, courage and influence to drive positive change in the world. Aligned with the World Economic Forum’s mission, they seek to spur public-private cooperation amongst these unique actors to demonstrate entrepreneurship in the global public interest. Representing more than 100 nationalities, Young Global Leaders are united by the belief that the urgent problems of today present an opportunity to forge a better future across sectors, generations and borders. Today, we are proud and excited to share the names of these individuals. We are eager to learn with and from them as they join a community seeking to increase more widely-shared and sustainable, opportunities for everyone. The Young Global Leaders is a community of remarkable leaders under 40. The list features three heads of state and ministers from every continent. It highlights artists with the courage to spotlight unseen issues worthy of global attention. It also acknowledges leaders changing the future of work, both at established Fortune 500 companies and organizations upending their industries. 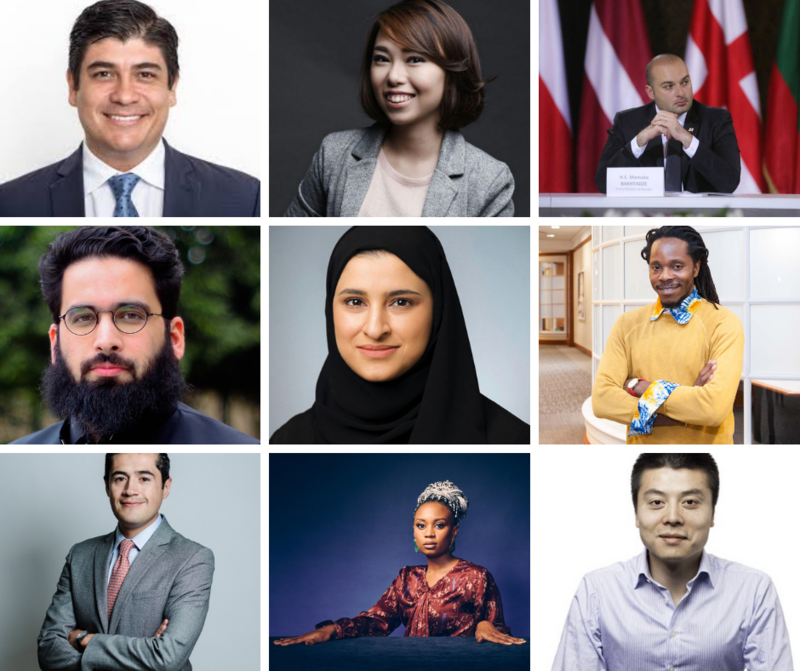 Some of their profiles are presented below, and we invite you to join us in celebrating the entire YGL Class of 2019, all of whom are pushing boundaries in their fields and beyond. Our expectations of them are high, and we know they have the resolve and ability to foster the new leadership our future requires. Umra Omar - Umra Omar founded Safari Doctors to provide basic health services in conflict-ridden Lamu County, Kenya. The organization deploys medical teams to indigenous communities using a combination of boats and motorbikes, and sets up mobile clinics to provide critical care. Under Umra's leadership, Safari Doctors saves thousands of lives a year. Victoria Alonsoperez - Victoria Alonsoperez is an engineer and inventor. She founded Chipsafer, a platform that helps farmers track their livestock's behaviour to detect anomalies. Her technology provides important data to support effective and sustainable farming, and has been praised with a number of awards for its unique approach to addressing livestock management. David Moinina Sengeh – David Sengeh is the first national Chief Innovation Officer of his country, Sierra Leone, and also the African continent. He heads the recently formed Directorate for Science, Technology, and Innovation and serves as an adviser to the president of Sierra Leone. A graduate of MIT and Harvard Universities, David focused his academic work on biomechatronics and invented technology to improve the lives of people with physical disabilities. He is a youth advocate and innovator across industries. Richard Walker – Richard Walker is the Managing Director of Iceland Food Warehouse, a frozen food and grocery retailer in the United Kingdom. He has committed to removing plastic packaging from Iceland's own label range by 2023, and palm oil as an ingredient by the end of 2018. His commitments have spurred important conversations about the role of business and retailers in advancing sustainability practices. Carlos Alvarado Quesada – Carlos Alvarado Quesada is Costa Rica’s 48th President, and has made headlines for abolishing the use of fossil fuels in his country. He aims to make Costa Rica the world’s first “carbon zero” country, and he is looking for other nations to follow. This is just one of the admirable examples that Costa Rica has set for the world. Katherine Maher – Katherine Maher is the Chief Executive Officer and Executive Director of the Wikimedia Foundation. Her expertise, at the intersection of technology, human rights and democracy make her a voice in-demand on pressing issues related to data access, privacy and governance. Over the course of her leadership of the Wikimedia Foundation, Katherine has become one of the leading advocates of disseminating free and accurate knowledge digitally. Ahd Kamel - Ahd Kamel is an award-winning actress and filmmaker, who began her journey 14 years ago when cinema was still banned in her native Saudi Arabia. Her personal journey, overcoming various barriers to become a pioneer in her field, is an inspiring lesson in perseverance and strength. She has written, directed and acted in her own two award-winning short films. Qian Liu – Qian Liu is an influential economist and business executive. As Managing Director of The Economist Group in Greater China, she has deep knowledge of the Chinese economy, understands both China and the West very well, and has shown exceptional ability to bridge the two in the age of China rising and new globalization. She is also a prominent advocate for gender equality in China, and introduces cutting edge global economic research on gender, and promotes intelligent public debates to achieve social progress. Zheng Huang - Founder of Pingduoduo, Zheng Huang is a phenomenal entrepreneur in China and game changer in the China e-commerce market. Brought up within a working class family, Huang showed his talents and outstanding ability from a young age. Prior to his entrepreneur journey, Huang was with Google from 2004 and was a founding member of the Google China team. Huang received his bachelor's degree in computer science from Zhejiang University and his master's degree in computer science with a focus on data mining from University of Wisconsin-Madison. Rima Assi - Rima Assi works with companies and governments to sharpen their strategic risk management, helping them anticipate and respond to market turbulence. In the wake of the 2008 financial crisis, she helped a leading bank in the Gulf region identify its capital and liquidity requirements, design new monitoring and management tools, define adaptive scenarios, and quantify opportunities to release liquidity and capital. What does it take to be a Young Global Leader? Nora Khaldi - Nora Khaldi is an award-winning TEDx speaker and a highly published mathematician and scientist. Nora’s revolutionary and innovative ideas and inventions have been awarded and recognised by the likes of Forbes, Wired and the EU Commission. She is the founder of Nuritas, the first company in the world to introduce artificial intelligence to the food arena with the aim of creating the future of food and personalised nutrition: in a nutshell, the future of health. Nuritas was recently classified amongst the 21 most innovative startups in the world along with Uber. Tigran Khudaverdyan – After a series of successful projects at Yandex, Tigran Khudaverdyan assumed leadership of Yandex Taxi in 2014, and negotiated its independent structure through a deal with Uber in 2015. Thanks to smart routing, machine learning, demand forecasting, and smart order distribution, the app made taxi services accessible, fast and safe over a short span of time. Mamuka Bakhtadze is Prime Minister of Georgia, having progressed into the role from being Minister of Finance and Special Representative of the New Silk Road. He started his career in the transport and energy sectors, and promises to usher in liberal reforms, European Union membership, and NATO membership for this South Caucasus country. Juan Gerardo Guaidó Márquez is a Venezuelan engineer and politician serving as the President of the National Assembly of Venezuela. He is a member of the centrist social-democratic Popular Will party, and also the federal deputy to the National Assembly, representing the state of Vargas. He has come to the fore in a time of political and economic crisis in his country, taking a public oath to serve as interim president of Venezuela.